Situated on a beach on the Mirabello Bay at Agios Nikolaos, northeastern Crete, Hermes Hotel is only five minutes away from the bustling town-centre. Its location makes it ideal for a long stay holiday, a conference meeting, a nature-lovers excursion, or even a city-hopper’s journey. All 211 guestrooms and 6 suites are equipped with direct-dial telephone lines, satellite TV with music channel, hair-dryer, A/C, refrigerator and private WC with bath. 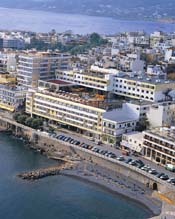 The hotel’s fully air-conditioned restaurant serves rich breakfast and dinner buffets overlooking the astonishing Mirabello Bay. Light snacks are served at the pool-side snack bar, while the “Kafenion on the ground floor has Greek-style coffee and exclusive local wines. A large rooftop seawater pool and sun terrace opens to panoramic sea views, giving the feeling of being on the deck of a boat. 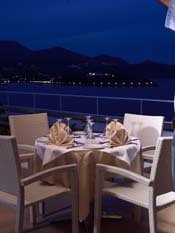 Cocktails can be enjoyed at the romantic “Aegean Bar” or the atmospheric “Zali Bar” on the ground floor. An Internet corner and library facilities are located on the ground floor. There is also a complete fitness centre and a convenience store. 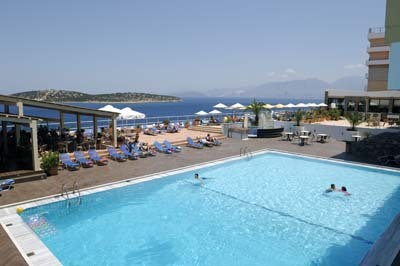 There is a diving centre on the waterfront and next to it a wealth of water-sport facilities. In front of the hotel, a new shingle beach has been created in order to provide hotel guests with the unique experience of bathing in the BLUE FLAG crystal clear waters. A tunnel connects the reception hall of the hotel directly with the beach. A conference room accommodating up to 250 pax is located on the 4th floor of the hotel, for all types of business or social events.